Cocoa trees grow exclusively in areas that meet certain specific conditions. The cocoa belt is an area of land around the equator between 20 degrees latitude north and south. Most cocoa even grows within 10 degrees of the equator. The soil has to be fairly loose and the climate humid. Temperatures must be between 18 and 30 degrees Celsius, with precipitation fairly constant and minimally 1,000 mms per annum. Cocoa trees must not receive too much sun, nor too much shade. Cocoa cultivation is possible up to about 1,000 metres above sea level, but most cocoa is grown below 300 metres. Cocoa cultivation initially spread into the immediate vicinity of the original habitat of the cocoa tree: from Brazil and Mexico to Central America and the Caribbean area. In the sixteenth century, the Spanish introduced cocoa to the Indonesian archipelago, as well as to West Africa, which now accounts for more than half of the yearly world crop. In Southeast Asia, production has also markedly increased. Climatic conditions have a strong influence on the size of the crop. All the conditions mentioned earlier restrict the number of areas where the cocoa tree thrives. 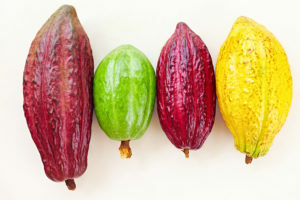 In the past there have been attempts to grow cocoa in other areas, but although initially appearing to be successful, these attempts proved fruitless. Frost, epidemics and insect plagues sometimes destroyed entire plantations in a very short time. 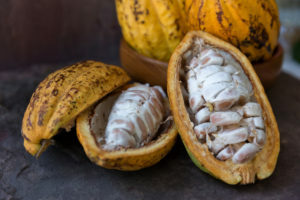 Apart from being choosy as regards location, soil conditions and climate, the cocoa tree is susceptible to plant diseases, fungal infections, and infestation by insects or rodents. This is the reason why modern plantations devote so much attention to crop protection. An efficient modern plantation is capable of producing around 1,500 kilos per hectare. This is more than four times the average yield of three hundred years ago. As a result of difference in soil, climate and cultivation cocoa beans possess different properties. The three main nursery subspecies are criollo, forastero and trinitario. Each of these subspecies has its own characteristics. Criollo is lighter and more delicate, with a fine aroma. Forastero has a high yield, withstands differences in climate more effectively and therefore has become the most prominent grade. Trinitario is a hybrid form of criollo and forastero. It is wrong to say that one subspecies of cocoa tree is superior to another. Each type has its own chemical and physical properties. Moreover, cocoa, like coffee for example, is far from uniform as a raw material. The manufacturer’s art is to blend various types of cocoa beans so as to guarantee products of a consistent high quality. What is a good consignment of beans? A good consignment or lot consists of fully fermented cocoa beans of reasonably uniform size. Such lots contain few broken beans, insects or husks. Every lot has to be checked for taste, aroma, colour, size, fat content, mould, husk percentage and other impurities. All these factors codetermine the market value of a consignment. It goes without saying that supply and demand on the world market are the main pricing factors. In the producing countries, local traders and central sales organisations prepare cocoa for export. In these countries traders, buyers, brokers and agents carry out their trade and together form the marketing parties who agree about quality, the time and place of delivery, and about quantities. Since supply is extremely vulnerable to climatic changes, the price of cocoa may rise or fall considerably during the year. Buyers – i.e. 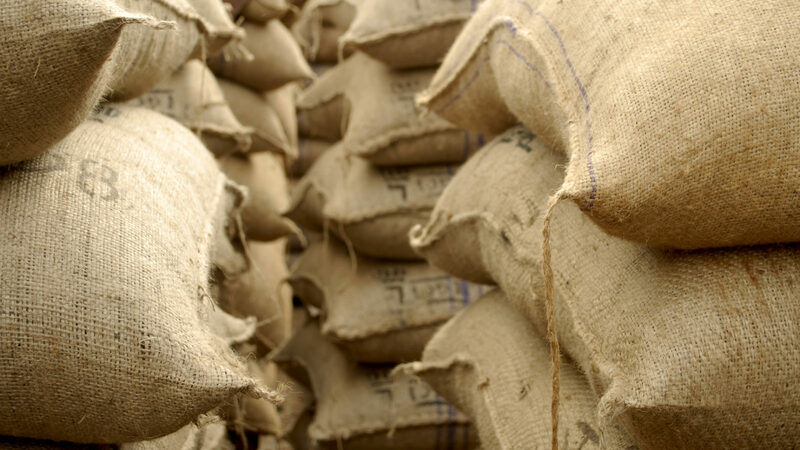 the cocoa processing industry and its clients – naturally wish to protect themselves against such price fluctuations. The futures market in cocoa owes its existence to these uncertainties. The world price of cocoa is determined by the futures market. Without having to conduct personal meetings, buyers and sellers are able to conclude contracts about future deliveries of cocoa beans on the so-called futures market. At the time of negotiation the cocoa beans in question usually have not even begun to grow, and so this not yet existing cocoa provides an opportunity for a lively and exciting world-wide trade. The contracts are registered with the Clearing House. Via this agency a delivery commitment can be nullified by completion of a sales contract for the same quantity and month of delivery. The Clearing House settles the differences in price. The most important futures markets are in London and New York. Price trends can be closely followed anywhere in the world. Not infrequently cocoa beans travel half the world before being processed. Therefore it comes as no surprise that the international cocoa trade plays such an important role in bridging differences in time, place and price. Producers like to sell when the price is high, and buyers prefer to buy when the price is low. Between these two there is the trader, who is prepared to buy at high prices and to sell when prices are falling. This may seem illogical, but by means of futures market contracts traders cover themselves against risks. In this way they protect themselves, their suppliers and their buyers against price fluctuations, while making money in the bargain. 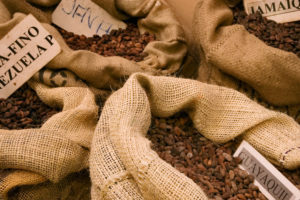 Traders provide their clients with additional services, for example, by financing transactions in advance on behalf of their suppliers or buyers; or by securing certain types of cocoa for their clients, which the latter, without interventions, might have bought under less advantageous conditions. As a raw material, cocoa is an important source of income for many producing countries. However, yields can vary from year to year. It is not surprising therefore that the governments in these countries are closely involved in the ups and downs of cocoa production and its export, and that international treaties have been concluded in support of these countries, of which the Treaty of Lomé is the best-known example. In this treaty the European Union commits itself to refrain from levying import duties on cocoa imports from a number of producer countries. In the past, attempts have been made to stabilise the price of cocoa by including long-range price agreements in treaties between producer and consumer countries. However, such treaties have proved not to work very well in practice. In the early 1990s, some West African nations privatised their raw materials industry, and this process is still continuing. The safeguarding of cocoa bean quality requires special measures. The hot, humid climates of the countries of origin are not ideal for storage and processing. 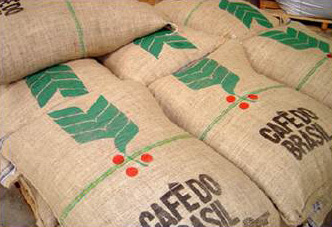 Traditionally cocoa beans were shipped in sacks made of strong jute fabric. In the last few years bulk transports, in which the cocoa is loosely dumped into containers, have grown in importance. It is expected that the majority of cocoa transports will eventually take place in this modern form, with important consequences for the cocoa trade as well as for the loading and unloading of ships. The cocoa ports must be favourably situated vis-à-vis the cocoa-processing industry. Amsterdam is such a location. This is one of the reasons why the Amsterdam region is the largest cocoa entrepôt in the world. On arrival the warehousing companies check the loads for quality and/or weight, by taking samples of each consignment and separating the damaged parts. These companies also handle the completion of documents and the settling of possible damages. 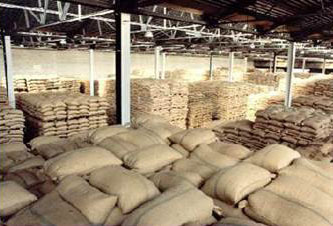 The sacks or containers are stored in warehouses or are directly transhipped to the cocoa processing industry. Also, in the modern silos of today cocoa blends can be produced to the client’s specification. Transport is by road, rail or water. Apart from the logistical side, warehousing and inspection companies have other important functions. Their sheds also contain, under rigorously controlled conditions, stored consignments for the London futures market – the London International Financial Futures and Options Exchange (LIFFE). It is not surprising therefore that the warehousing companies are well-known for their reliability and knowledge of the logistics, as well as for their flexibility.